year, over 70 students were left without a yearbook because there were no extras. Don’t miss out. Order yours today! Order your Log yearbook outside room 1505, in the main office or online at www. yearbookordercenter.com (order #8881)at its sale price of $55 until Sept. 30, After that, books may be ordered through Herff Jones only for $70 until Jan. 24. 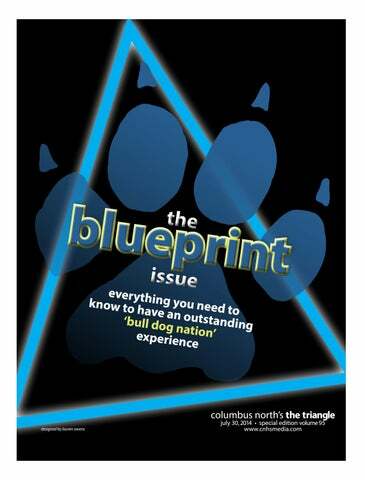 Blueprint is a special edition of The Triangle, published specifically for the Class of 2018 and students new to Columbus North High School. WELCOME! he annual Trike Race takes place on the track at Max Andress Field the afternoon of Homecoming the last two periods of the day. Prior to the even, students may form teams with their friends, name themselves and dress up. Two types of trikes, big and small, make up the competition. Students not competing watch from the stands and may participate in special field events between heats. omecoming is the annual football game followed by a dance. The Homecoming queen is crowned at halftime following the presentation of the court. The tradition of Homecoming brings CNHS Alumni to the game as well as current students. hysics students put their skills to the test by construction their own boats and racing them across the Chick Newell Natatorium pool in the annual Boat Race. Students in resources may go down to watch the excitement. ttending a North vs. East game fun; in fact, attending all of them is a must. Fans dress up to a theme or in blue and white to cheer on the Bull Dogs against the Olympians in the annual rivalry. he week before Spring Break features Blah Week when students dress up to a different theme each day, such as Tacky Tourist Tuesday (above) and Throwback Thursday. Last spring, CNHS Media conducted a Twitter-based competition to find the student with the best ensemble each day with the winners receiving a Starbucks gift card. Students eat lunch in the Bull Dog Cafe May 28. The cafeteria was built in 2012 during construction. “I like to talk to friends and play games during my lunch period,” sophomore Batul Fanee said. 44% of Freshman enjoy eating in the cafeteria. 56% do not. Mr. Miller is the ISS (in-school suspension) supervisor here. Below are his responses regarding his experiences with punishment. Senior Lexi Dykes is one of the co-editorsin-chief for cnhsmedia.com. According to Dykes, the site’s content is determined by the students. “Content is based on what we believe students will be interested in knowing. We try to provide additional information students can relate to,” she said. BNN Senior Allison Griffith is a segment supervisor for BNN. She is a staff member that specializes in personality profiles. BNN covers a wide variety of topics, from American Pie and Prom to the plane crash that occurred in Columbus last summer. “Watch BNN because it is informative and eye-opening,” Griffith said. To determine content for BNN, staff members get together for brainstorming sessions. Log Junior Anna Horak is a staff member on the Log yearbook. One of her favorite topics to cover is current events. “It’s cool to look back and see what happened in your community, state and world from the future,” Horak said. According to Horak, Log is a little bit different than the other three publications. Instead of actively presenting news, Log gives it as an overview. “People will look at it and be like, ‘I had no idea that happened this year!’” she said. Adam LeClerc and Andy Carr (CN ‘14) were part of The Triangle newsmagazine staff. They worked on design and cartoons. LeClerc also wrote a column. Last year, The Triangle spent the second semester covering topics in thematic issues. “We try to cover things that happen at North and around the nation,” Carr said. “Food, fight and trust. It was basically a list based on those topics,” Carr said. “Overall, we take it local,” LeClerc said. This type of coverage was new to The Triangle. Typically, The Triangle aims to cover a lot of news. The Triangle looks for stories that are powerful, relevant and engaging. To contribute to The Triangle, students can write letters to the editor. These letters may be printed in The Triangle. BYOD/tech/stu-wifi read what faculty have to say about BYOD: Is it truly useful to students? Here, there is a system for students to bring smart phones, laptops, and other internet compatible devices. This system’s purpose is to assist students on projects and assignments that may require the internet. This system is called BYOD or bring your own device. This system has its pros and cons; for example, not everyone has a smart phone or laptop. It can also be an easy distraction for texting or playing games in class, but it is a useful resource for students because they are already familiar with the device. The BYOD is a great privilege that should be used properly and greatly appreciated. how students feel about BYOD Do you use your own device at school for school work? Q: What sports do you play? A: I play football, basketball and track. Q: What are the some perks and challenges with doing three sports? A: Some perks of being a three-sport athlete are staying in shape throughout the whole year and the different friends I have in each sport. A huge challenge is balancing school and sports at the same time. Q: Would you encourage other students to be multi sport athletes? A: Yes, I would encourage people to be a multi sport athlete because you stay active throughout the whole year, and you meet a lot of people, but it is very difficult to balance school and sports. The Fellowship of Christian Athletes is a club designed for Christian athletes to come together and play games, eat treats, and worship god all at one time. Students interested in helping the community will come together and host events, volunteer and collect donations for organizations. This club is based around servicelearning. Bullying is hurtful, harmful and damaging. Students will stand together to overcome bullying to make North a safer, more inclusive place to be. 4bnn BNN, or the Bull Dog News Network, is the news broadcasting section of the journalism program. To plan and broadcast BNN, you must either enter the journalism or photojournalism classes. Students interested and dedicated to the Democratic or Republican political party will come together and discuss politics. In this club, individuals will come together and bowl as a team and compete in bowling tournaments as well as practice. People with strong interests in the environment coming together to fight for a common cause is what this club is about. In thus club, you will go through and collect recycling and other environmental tasks. Help Columbus North save the environment. The Best Buddies club encourages all types of friendships between all types of students. If you are a social person and thrive from interactive experiences, you may want to consider this club. Have a calling to brain games and calculations? Try chess! In this club, you can try your skills against fellow students. The Bull Dog History Club is a club specifically created to help students find out their rich family history and heritage through research and club meetings. Students come together to overcome religious differences to discuss tolerance, friendship, faith, etc. Together students stand, becoming a group rather than simply individuals. of America, is a club dedicated to preparing students for careers in the medical practice. Columbus North takes its yearbook very seriously. Join and plan, write design the CNHS Log. The Triangle is the school newsmagazine. Join the journalism and media classes to learn how to write, design and take photographs. The media website is a great way to get involved in school activities and learn graphic designing and group activities. Business is one of the leading majors in America. Get a head start on a business degree or major by joining the C4 Business classes and the BPA club. DECA prepares future businessmen and women in careers in marketing finance, hospitality and management. If you are a top journalism student, you may be accepted into this honor society. You must have been on a staff for one year. language classes to be in these clubs, but it is recommended. be a fun and intellectual experience. Join the C4 Engineering classes to participate in the robotics club. students for future farming careers. This choir competes around the midwest and provides a musical outlet for students interested. Join any of the bands if you have interests in reading or playing music. Marching and concert are options for students. Interested in writing and performing? In this club you’ll get to do both. This newly formed club provides an outlet for creativity. perfect way to be social with people you have common interests with. your time before or after school to be with people you enjoy and doing something productive with your time and energy. look to see what extra curricular activities you participate in, and clubs are something they may find interesting about you. best option for their school by proving that you can work with people and are dependable to show up to events like club meetings. yourself by learning how to better interact with people and learning skills your club has to offer. club has been proven to improve your grades. opportunity to meet people outside your classes. tive attitude, Isbell was able to adjust. of what North has to offer. as bad as you as you think. You can make advantage it to your classes; you will make newisn’t friends. ” “I had four different tours at North, which think. You can my other schools didn’t do, so that was make it to your -senior Rachel Evener “Make a lot of friends. They will help you find very helpful.” classes; you will The best advice that Isbell could give to new friends.” your classes and locker. Also, be friendly.” -sophomore Darianmake Knops an incoming Bull Dog is to be organized senior and maintain a positive attitude. Contact The Triangle at greenk@ bcsc.k12. in.us or 376-4260 today!